SoundRoots not only loves great music, we love when there's a great story behind the music. Such is definitely the case with Staff Benda Bilili. Back in 2009, when reviewing the group's album Tres Tres Fort, I wrote that "it sounds like a movie script." It does, and now it is. The group of disabled musicians who performed near the zoo in Kinshasha, Congo, have now gone on to play major festivals around the world. Though their recent tour of the USA was cancelled due to "visa complications," you still have a chance to see them perform via the big screen. Benda Bilili! is a film about outcasts who defy a system that defines them as marginal. It is not a musical film, but the band’s songs complement the narrative. 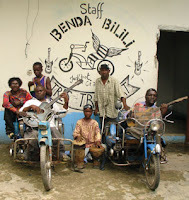 Every problem encountered by the Staff Benda Bilili gives rise to a song they then try out on the streets. The film is set in emblematic sites. The leader of the band, Ricky, sets up shop in the Sonas traffic roundabout in the center of Kinshasa, a genuine “court of miracles” in the heart of the financial district. This sidewalk corner is a true crossroads of broken destinies, a parliament of the starved and dying; it becomes the band’s headquarters. The band also frequents the Kinshasa zoo, a wasteland garden littered with cages haunted by emaciated animals. It is a world apart, populated by shégués (street kids), military dealers, hoods, and thugs of all kinds. In this deafening and asphyxiating city, the zoo is the only place of relative calm—a decaying sanctuary that evokes a lost paradise for the Congolese. The Staff Benda Bilili rehearses and even recorded parts of their album there. Through the wandering band’s “migration,” we see the city streets as sites of transition, an ever moving and dangerous physical environment, full of spikes and pitfalls. Visually, it is the ultimate expression of the political corruption of the city and its effect on the urban landscape that surrounds them—vertiginous holes in the middle of the roadways, lakes of rancid water, crevices that create monstrous traffic jams. The calm determination of our heroes and the hypnotic clicking of their tricycles contrasted with the din of the thundering city. As the success of the orchestra grows, the street people get worked up, unite, and regain hope—inspired to act on behalf of all the disenfranchised. From the seedy sidewalks of Kinshasa to the hype clubs of Copenhagen, the limping odyssey of the Benda Bilili overthrows clichés regarding handicaps and misery. It dares us to question our own limits and our ability to bounce back.